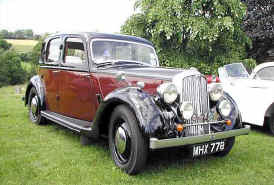 Surrey Vintage Vehicle Society Meetings 2004. Rapid onset of darkness heralded our last evening meeting of the season which drew a rather disappointing score of only 19 proper cars, of which only 7 were pre-war. The day had been mainly grey with scattered heavy showers that worsened as the afternoon wore on. Thankfully the evening stayed dry which enabled the friendly landlord to photograph all the cars as they arrived, regular snappers unavailable. For a fair number of our members the journey to the east of the A22 is largely uncharted territory but nevertheless quite a few took advantage of the relatively fine day to exercise their vintage motors. 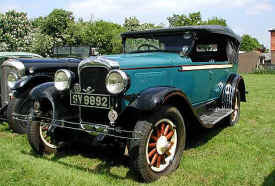 It was the maiden visit of David Smart's new Model F Cadillac which was being tested prior to going on the London to Brighton Run. Also there was Alan Reid's 1930 S6 Douglas motorcycle ridden a full quarter mile. The Dog & Duck is located on Outwood Hill in Surrey not far from the Outwood Windmill. We had an interesting turnout of cars which included an antipodean Amilcar driven by Desmond who was garaging it for an Australian friend. The friend had bought it over and was 'doing Europe' in it prior to shipping it back. Also there was a Mk1 Cortina built up from three cars, and rarely seen van de Plod with his shiny XK140. The Edenbridge & Oxted Show again had over 50,000 visitors enjoying quite good weather. It was not as stiflingly hot as it had been for quite a few weeks before and for some time after. The week before was quite wet with floods 'up north'. Showers and cool weather dampened the joys of Sunday and quite strong wings cooled down Monday. Full house of Classic and Vintage vehicles with a large number of SVVS Members. The Great SVVS Summer Picnic was held this year on a pleasant day at a very rural location of Church Farm beside the rather lovely St Mary's Church in Horne. As usual free drinks greeted the Members on arrival and this time hosts Julie and Bozi also provided Hotdogs. A few minutes of drizzle did not spoil what was otherwise a lovely day which finished off in funny driving tests round the field, eventually won by Chris Cuss. The Lingfield Steam and Country Show is now a regular feature at the Blue Anchor site near Lingfield. Attendance seemed to be somewhat smaller this year as far as the cars and commercials were concerned. Steam however was as magnificent as ever and seemed to have a few more traction engines and steam rollers. SVVS cars were represented as usual in a well presented paddock prepared by our Group Organiser. The Plough on the A25 in the village of Bletchingley has again been our most popular venue for an SVVS evening meeting. 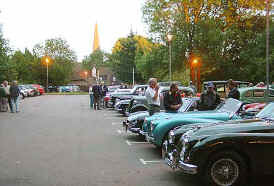 Once more we enjoyed a packed car park for our July meeting. As has happened before, it was perhaps a little too packed as a number of 'Cruising Cars'appeared, mainly of transatlantic origin, together with an unaccountable number of Volvos and also a huge turnout of M.G.'s. The day did not start promisingly and, very much like this time last year, rain poured down most of the morning which suggested the day could be a washout. Then the rain stopped, the sun came out and it became warm, so the thoughts of not going evaporated. Seems many did not reconsider because the turnout though good, was lower than usual for this pub. Rain started at going-home time, so some got wet. The Ardingly Show is not one that is noted in the SVVS calendar but is a Show that is attended by a number of our Members including our regular 'snapper' Tony Oakes who once again provided lots of interesting photos. The Ardingly Show has many classes of vehicles including steam traction engines, veteran, vintage and classic cars, caravans, motorcycles, fire engines, vans, commercials, tractors and machinery. The Six Bells has turned out to be an excellent venue. The pub is of the genuine olde worlde variety with enough low ceilings and uneven floors to present something of a challenge to the taller and less stable of our members. No car park has a larger tarmaced area for our cars and amply accommodated a fair turnout of 34 vehicles. A few spots of rain during the evening caused a flurry of hood raising but came to nothing. Heavenly weather blessed our visit to Heaven Farm for the Cream Tea. All of our Members were seen basking in the warmth and sunshine of Sussex and it was particularly good to see Dianne Errol at the 'do'. Many of the 'cream run' regulars attended and were seen munching into mountainous dollops of cream and jam with a light base underneath. Good for the spirit, - if not the waistline. Some interesting new cars too. Normally our 'snappers' Tony Oaks and Bozi Mohacek are at Pease Pottage clicking away, but not this year. Two of our members who are also in the HCVS were organising the mid-way Tea Stop which has been moved from Pease Pottage to the car park of the Crawley Football Club at Broadfield Stadium. Oakes and Mohacek somehow volunteered to assist, so spent the day directing traffic rather than taking pickies. As is traditional, our summer evening season started with a visit to the Skimmington Castle, a pleasant olde worlde pub hidden on Reigate Heath. The landlord had once again ensured that no moderns crept into our half of the car park which was again completely filled. The evening was marred by onset of continuing rain which was the first rain for many SVVS meetings and only which stopped as we started to go home. A new venue for the SVVS at this time of year, and a diary change from The Wattenden Arms in Kenley which is shown on the current Events Page. This was our first lunchtime meeting of the year and a very nice day for it it was too. Pictures show that many of the regulars attended, that is those who we clever enough to read the magazine in fine detail and spot the change of venue. Not all of us did, hence not a big turnout! After the great success of our Annual Dinner last year held at the Reigate Hill Hotel it was decided to repeat the venue for this year's event, which proved just as successfully. The highlight of the evening was the speech given by Sgt. Richard Cole who is the Chief Driving Instructor of Surrey Police for both cars and motorcycles. The speech was most enjoyable and included many amusing motoring anecdotes.